Getting To DC – Toastmasters 2016 International Convention – Washington D.C.
For a clear and simple overview of transportation options that can take you almost anywhere, check out goDCgo (at www.goDCgo.com). On the “Tools for Getting Around” tab, this site includes a link listing helpful Transit Apps you can download for use during your stay. 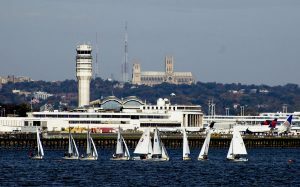 DCA is the closest and most convenient airport to D.C., located 3 miles south of the city in Arlington, Virginia, just across the Potomac River. However, there are no customs clearance facilities and therefore it can only serve destinations in the United States or airports in Canada and the Caribbean that allow U.S. customs pre-clearance. Ground Transportation: See the airport’s Parking & Transportation Web page. Taxi service to the convention takes approximately 15 minutes (with no traffic problems) and costs about $20. 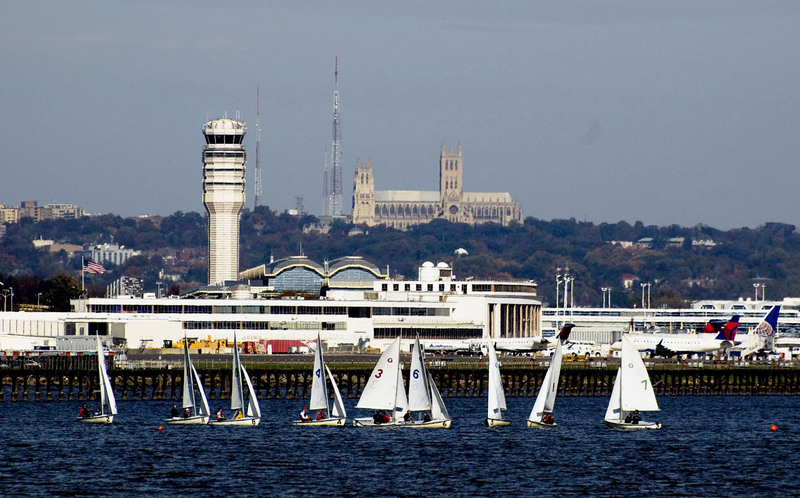 Closest airport to the District line, located on the Virginia Side of the Potomac River. Volunteer-staffed Information Desks are located in each terminal. WMATA operates Metrorail service to the airport via the Blue and Yellow lines. The trip to the convention takes approximately 20 minutes and costs approximately $4. Metrorail operation hours are different during the SafeTrack track work plan in that the Metrorail system closes at midnight on weekends. IAD is located 26 miles west of D.C. in Sterling, Virginia, and serves as D.C.’s primary international airport. The layout includes lengthy corridors and long escalators and you will have to take a train between the main building and the concourses – expect that you will need some extra time to get from and to the gate. Many carriers serve the airport, which serves as an East Coast hub for United Airlines. Airlines Served: Aer Lingus, AeroFlot, AeroMexico, Air China, Air France, Alaska Airlines, Austrian, Avianca, British Airways, brussels airlines, CopaAirlines, Delta, Emirates, Ethiopian, Etlhad, Frontier, Iceland Air, jetBlue, KLM Royal Dutch Airlines, Korean Air, Lufthansa, porter, Qatar Airways, Silver Airways, South African Airways, Southwest, Scandinavian Airlines, Sun Air, Turkish Airlines, United, VirginAmerica, and Virgin Atlantic. Ground Transportation Information: See the airport’s Parking & Transportation Web page. Washington Flyer Taxi is the exclusive provider of taxis from IAD airport. A taxi trip to the convention costs around $75 and takes about 40-60 minutes. The taxi stand is down the ramp from the baggage claim area. Uber is a popular method of transport between the airport and the city. A non-surge rate trip using UberX from IAD to the convention costs around $50 and takes about 40-60 minutes from IAD airport. The pickup point can be reached by walking up the ramp after exiting the baggage claim area. TIP: Metro’s Silver line, a line built out to Dulles Airport, is expected to be complete in 2018. Until then, the following is the current public transportation option. You can take the Silver Line Express Bus (one-way fare $5, departing every 15-20 minutes) between Dulles Airport and the Wiehle-Reston East Metro Station. Transfer from the Silver Line train to a Green/Yellow Line train at L’Enfant Plaza and proceed to Mount Vernon Square for access to the D.C. Convention Center and the Marriott Marquis Hotel. Read the WMATA section for more on how to use Metro. BWI is 30 miles northeast of D.C. and 10 miles south of downtown Baltimore, near Glen Burnie, Maryland. Compared to IAD and DCA, BWI is the farthest from D.C. Ground Transportation: See the airport’s ground transportation Web page. Taxi service to the East End in DC (the larger local area where the Marriott Marquis is located) takes around 45-75 minutes and costs around $100. BWI Express Metro Bus (BWI Express/B30) service operates between the airport and the Greenbelt Metro station every 40 minutes, 7 days a week. The Greenbelt station is the Maryland endpoint of Metro’s Green Line and also is served by some Yellow Line trains. TIP: From the Greenbelt Metro Station you can take the Yellow Line or Green Line Metro train directly to the Mount Vernon Square Station, which is adjacent to the D.C. Convention Center and mere blocks from the Marriott Marquis Hotel. Check the Metrorail Alerts and Advisories for any last minute updates. MARC commuter-rail train and Amtrak operate between BWI Rail Station and Union Station on Capitol Hill, also stopping at the New Carrollton Metrorail Station (Orange Line). A free “Amtrak/MARC” shuttle bus runs from the airport terminal to the BWI Rail Station every 12 minutes. The journey takes 10 minutes. If you are in a rush, you can take a taxi for $8–9. MARC service from BWI to Washington’s Union Station is available on the Penn Line and costs $6 one-way. MARC service is infrequent on the weekends and after 7 p.m. weekdays; check the online schedules. Amtrak service costs $13-22 and is cheaper if purchased online in advance. Uber is a popular method of transport between the airport and the city. A non-surge rate trip using UberX to the convention from BWI costs around $60 and takes around 50-75 minutes. SuperShuttle operates a door-to-door shared ride service to anywhere in the D.C. area. The fare to D.C. is $37 for the first passenger in your party, $12 for each additional passenger. Shuttles leave when full or 20 minutes after the first passenger bought a ticket. Adjacent to Capitol Hill, Union Station (unionstationdc.com), is a major hub within the city, served by Amtrak, Maryland Commuter (MARC), and Virginia Commuter (VRE) trains. Union Station’s excellent ground transportation Web page is easy to read and provides many useful links. Union Station has its own Metro Red Line station. Just outside, Metrobus, DC Circulator, and tour-oriented bike rentals are available, supplementing taxi service. Car rentals (Alamo, Avis, Budget, and Hertz), regional bus service (Bolt Bus, DC2NY [888-888-DCNY], Megabus, Greyhound, Peter Pan, and Washington Deluxe) and tourist buses (DC Ducks, Big Bus, City Sights DC, Grayline, and Old Town Trolley Tours) operate from the mezzanine and parking levels above the station tracks. TIP: If you need assistance or have special transportation needs, Travelers Aid (202-371-1937) has an office right in Union Station. Wheelchair and scooter rentals are available from Scootaround (888-441-7575) and Scooterplus (866-474-4356). TIP: DC Circulator buses DC can get you to most downtown attractions at $1 per ride. Look at the DC Circulator information in the PUBLIC TRANSPORTATION section for more information. Many bus companies operate service to/from New York City, although Greyhound is the only company that provides service to smaller cities around the United States. Most bus companies pickup/dropoff at Union Station in Capitol Hill; however, you have a lot of bus choices if coming from New York City. You do not need to book in advance, although it can be much cheaper to do so. Buses tend to be fully booked on Friday and Sunday evenings since weekend trips are popular among the locals. Most buses have power outlets and Wi-Fi access on board, although the Wi-Fi is not always reliable. BestBus, (202-332-2691). Operates service to/from Penn Station in New York City ($30-45) and, in the summer, weekend service to Dewey Beach and Rehoboth Beach in Delaware ($39); Pickup/dropoff at Union Station and Dupont Circle. BoltBus, (877-265-8287). Operates service to/from New York City and Newark, New Jersey; Pickup/dropoff at Union Station. Fares range from $1-45 depending on advance purchase and departure time. Eastern Shuttle, (212-244-6132). Operates service to/from Penn Station and Allen St in New York City ($21 weekday, $25 weekend). Pickup/dropoff in D.C. is at 715 H St NW, near the Gallery Place-Chinatown Metrorail station. Focus Bus, (215-625-7999). Operates service to/from New York City ($21) and Philadelphia ($15). Pickup/dropoff at 513 H St NW, near the Gallery Place-Chinatown Metrorail station. Greyhound, (800-231-2222). Operates service to/from almost every major city in the United States. Pickup/dropoff at Union Station. Fares to New York City range from $11 if purchased in advance on the internet to $45 on the departure date. Megabus, (877-462-6342). Operates service between Washington DC and 20 major cities including New York City, Baltimore, Boston,Toronto, Philadelphia, Buffalo, Pittsburgh, Charlotte, and Atlanta. Fares start at $1 when reserved far in advance. Pickup/dropoff at Union Station. Power outlets. Wheelchair accessible. Peter Pan, (800-343-9999). Operates service to/from New York City, with onward connections to several cities in New England. Fares to New York City range from $11 if purchased in advance on the internet to $45 on the departure date. Pickup/dropoff at Union Station. Washington Deluxe, (866-287-6932). Operates service to/from New York City. $22 on weekdays with advance purchase, $26-34 weekends or walkup. Free ticket with every eight purchased. Pickup/dropoff at Dupont Circle and Union Station in DC and Penn Station, Times Square, and limited dropoffs at Prospect Park in New York City. Power outlets. No advance purchase required. This hotel does NOT provide shuttle service to and from the airport. If you are using Metro (see the Public Transportation writeup about the Washington Metro System) to reach the hotel, read the following tips. TIP: From the Mount Vernon Square Station as you come up the escalator to the street level, the D.C. Convention Center is directly in front of you. You can walk through the convention center (depending on time of day and whether the convention center is open for an event) to the Marriott Marquis Hotel. An elevator is behind you as you approach the stairs to get to the concourse level. You can exit the convention center near the intersection of 9th and L Sts NW on the 9th Street or L Street side. TIP: Again, depending on the time of the day and whether an event is being held, you can enter the Marriott Marquis hotel (meeting room level) from the D.C. Convention Center (Exhibit Hall level, near the entrance to Exhibit Hall A). TIP: If entry to the convention center is not possible, you need to walk around it from 7th & M Sts to 9th & L Sts NW or to Massachusetts Ave & 9th St NW. The hotel front door is on Massachusetts Ave between 9th St & 10th St NW. 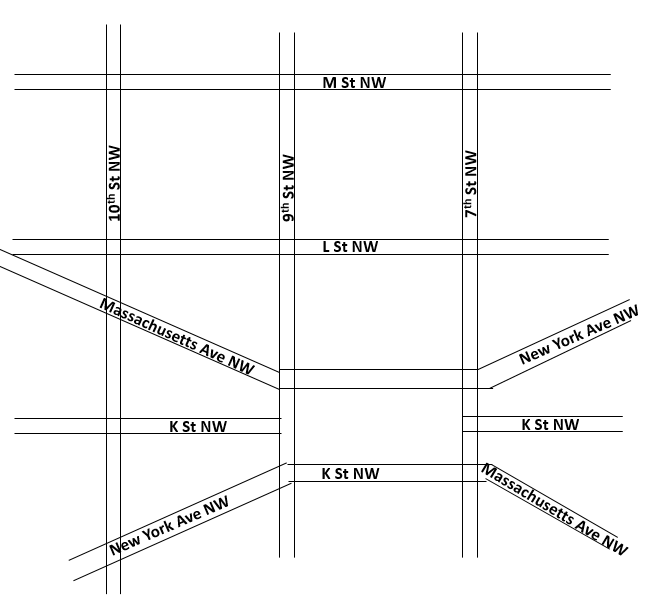 Read the ‘HOW TO NAVIGATE’ section in the DC History web page for how DC streets are laid out.